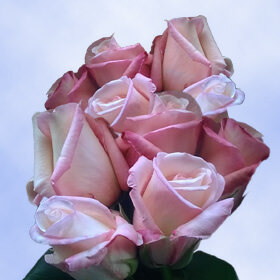 One of the most famous and widely known florets is the Bridal Pink With Darker Pink Edge Rose. It is depicted in some of the oldest artworks known to man. It is a symbol of love, gratitude, and appreciation. The Anna Rose is an any occasion floret that is appropriate to let someone know you have a crush on them or to remind the love of your life how much you care. When they are used in Wedding bouquets or centerpieces they can add a nice light touch of color that is not distracting and will add untold amounts of beauty. Shipped from our state of the art greenhouses via FedEx, you can be at ease that your flowers will arrive on time and undamaged. You must allow 2 to 3 days for the bulb to fully bloom into its maximum state. When fully bloomed it will look like giant pink stars. 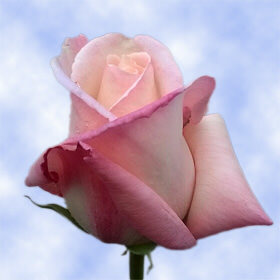 Your florets will arrive at your doorstep complete fresh and full of beauty, we guarantee it. 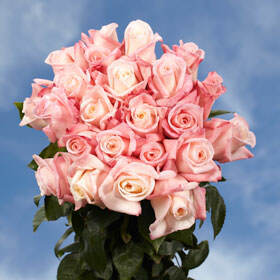 At Globalrose.com, we treat every blossom with great care and tenderness to make sure they remain as beautiful as nature intended. Place an order today and tell the one you love how much you care.